Width 182.4 cm | 71.8"
Depth 45 cm | 17.7"
Height 90 cm | 35.4"
The Proportion II Console was inspired by the extreme clarity and simplicity of the 20th century architectural style created by Mies Van der Rohe. Often associated with his aphorisms “less is more” and “God in the details.”, his mature buildings make use of modern materials such as industrial steel and plate glass to define interior spaces. Proportion II is structured in walnut wood with some satinwood details, making it ideal for any modern and functional living room. 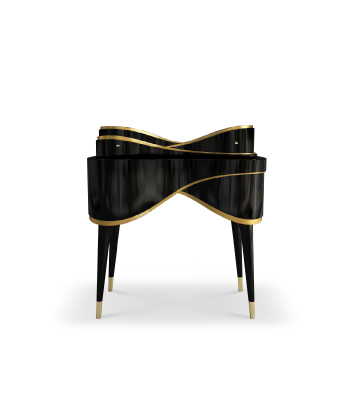 Structure in wood finishes composed of piano black lacquer, walnut wood, Ironwood, gold leaf, radiant orchid lacquer, blue lacquer with satinwood details. 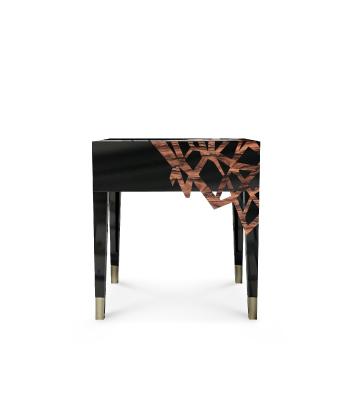 Legs in lacquered wood. Interior of the drawers in satinwood. Dimensions Width 182.4 cm | 71.8"